Before taking my dog on a long car trip what should I do? Many dogs have no trouble adjusting to a car journey, long or short, but for others it can be a bad experience if they have not been properly prepared, or their needs during the trip are neglected. First, if your dog has not been used to being in a car, take them for short trips, always before a meal rather than soon afterwards. This will help avoid car- or motion-sickness. Make the association with the car ride rewarding for the dog by giving a treat or meal as soon as the trip is over. How can I avoid car-sickness? Car- or motion-sickness is the result of the effect of irregular motion on the balance mechanism of the middle ear. The signs are restlessness, salivation and vomiting. Waiting at least six hours between the last meal and traveling will help. 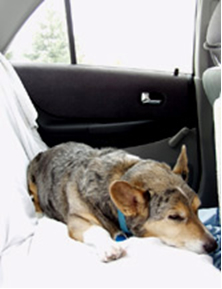 In severe cases of motion sickness, your veterinarian can prescribe medication to be given before a journey. What can I do to make my dog more comfortable traveling? Have the dog ride inside the car rather than in the back of a pick-up or inside a camper. Don't allow the dog to run and jump in the car, especially not near the driver.Make sure there is plenty of fresh air and that the temperature is not too hot towards the back of the car where the dog will likely be. If you need to open a window, keep it closed enough that the dog cannot stick his head out of the window and be injured by flying insects or pieces of gravel from the road. Stop at regular intervals, generally every two to four hours, to give your dog a chance to exercise, relieve himself, and have a drink of water. When you stop, secure the dog with a leash BEFORE you open the door. Observe notices for pet exercise areas and have a plastic bag supply in the car for “stoop and scoop”. What if I have to leave my dog in the car? Never leave your dog alone in a car. The temperature can quickly rise to a dangerous level, causing heat stroke, even on a cool day. Leaving a window partially open may not be enough and may invite trouble if a child pokes a finger into the car. How can I find motels or accommodations that accept dogs? Many bookstores have guides available. The directories of the many hotel chains usually indicate whether dogs are allowed (the number of rooms for pets may be restricted so check ahead). The Internet is a rich source of information on travel with pets. The AAA/CAA club also has useful resources for pet travel. Are there Pet Travel Clubs? Takeyourpet.com is one such club offering a directory of lodgings accepting dogs, veterinary hospitals, boarding facilities, etc. Traveling with your pet is becoming more common than ever before and restaurants and lodging facilities are responding to this trend. This client information sheet is based on material written by Ernest Ward, DVM.© Copyright 2005 Lifelearn Inc. If you prefer not to continue receiving e-mails, please FORWARD this e-mail to remove@vetgateglobal.com, instead of replying to this e-mail.